Dr. Hoban lectures to a full hall of people in the IRC about climate change. Some people roll their eyes at the thought of global warming, laughing it off as an innately liberal theory. What if, however, they heard it broken down into small, indisputable and objective facts? On Thursday, Jan. 14, Ferris students had the opportunity to do exactly that, hosting Dr. Susan Hoban, a senior research scientist from the University of Maryland Baltimore County (UMBC). Hoban works with an organization called the Joint Center for Earth Systems Technology (JCET), which in turn works with NASA. 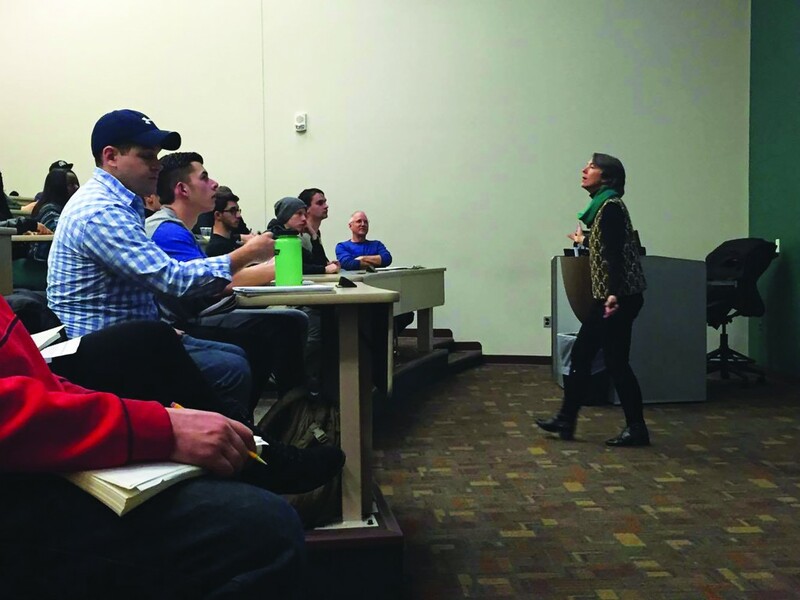 While her focus is primarily astronomy, Hoban came to Ferris to give a lecture on the changing climate and trends that have been appearing recently in the atmosphere and earth itself. Despite this not being her primary field of study, Hoban was well informed on the topic and stressed the fact that, unlike many fields, climate and weather are things that affect every person every day. To begin the talk, she eased the audience in, giving a brief background of the earth’s development and how it got to its present state. Despite the initial uncertainty of some students, they quickly realized that the purpose of the presentation was not to scare or gain support for an agenda, rather it was to inform. Hoban even went as far as to discredit some of the things often heard in passing or from the media. One student in attendance was Ferris chemistry sophomore Kelsey Diamond. Diamond happened to find herself in strong agreement with some of the points made by Hoban. “I think it was interesting how she used the history of the earth to give context to what is currently going on in our climate,” said Diamond. Hoban presented a timeline that did exactly that, dating back hundreds of years, illustrating the fluctuations and patterns in things like temperature, carbon concentration and a number of other measurements, building a strong foundation for her main points. Ferris graphic design sophomore Alysha West appreciated the manner in which the information was presented and explained. Hoban urged the audience to stay informed and pay attention to developments in the world of earth climate, cognizant of the fact that, despite interference and even opposing efforts, there are just some things that will forever continue to change.